All but three years ago, UK's Blood Red Saints dropped their debut album, Speedway, and it was pretty killer. Now the band returns with their sophomore effort with some new members in the band: Neil Hibbs (Arkhams Razor, Shy) on guitars and Andy Chemney, a long time friend of vocalist Pete Godfrey, on drums. The new album is Love Hate Conspiracies and it's pretty killer too. Essentially, Blood Red Saints are working their best musical angles, playing classic melodic hard rock with metal edge in an accessible AOR wrapper. 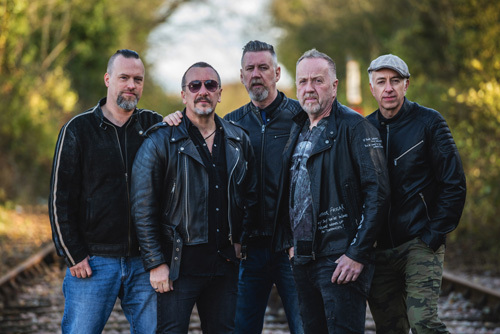 Their strengths are many: great songwriting that emphasizes melody, harmony, and groove; twin guitar rock riffs with metal edge gusto which lead to killer guitar solos; and terrific harmonious and melodic vocal arrangements. While listening to the album, I kept thinking that Godfrey reminded me of a certain vocalist. Then it hit me, he's got a little Jon Bon Jovi timbre in his voice. Additionally, there's more use of piano and synths within this album. For instance, piano drives the ballad Arms Wide Open. Synths have a strong presence in both It Is Over, where they play a large part in the arrangement and Sometimes, where they open the song. Both of those songs establish how Blood Red Saints blurs the line between melodic hard rock, melodic metal, and AOR. But that accessible AOR angle rises more so within the heavier Wake Up and largely lighter Exit Wounds, both driven by fine, catchy vocal arrangements. Alternatively, songs such as Another Freak, Something In Your Kiss, and LIve & Die are heavier numbers where the metal edge is self-evident, and then are powered by a bold rock groove. Suffice to say, with Love Hate Conspiracies Blood Red Saints have found their groove and delivered another powerful platter of metal infused, AOR friendly, melodic hard rock. Get it. Easily recommended. 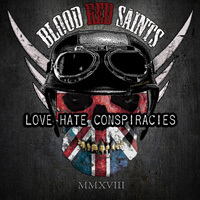 With Love Hate Conspiracies Blood Red Saints have found their groove and delivered another powerful platter of metal infused, AOR friendly, melodic hard rock. Get it. Easily recommended.